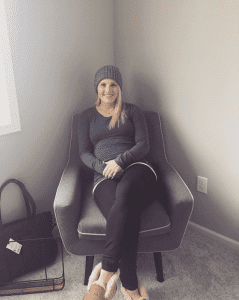 American ice hockey professional and gold medal winner for Team USA at the 2018 Winter Olympics, Jocelyne Lamoureux-Davidson shares her pregnancy tips and experience as she journeys through her first pregnancy. Q: What has been the biggest struggle adjusting from training for the Olympics to training through pregnancy? A: I don’t know if I would call this a struggle, but the biggest adjustment is the day to day fatigue and/or discomfort that I feel or don’t feel and being able to adapt every day. Every day is so different, my body is changing obviously in a way that I have not experienced so being able to listen to my body, know when I can push it or when I have to back off is different. 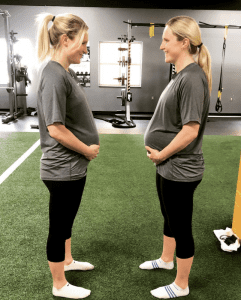 As an athlete I’m used to pushing through a certain amount of discomfort, but now my focus is keeping my body healthy for the baby and making sure I do what I can to have a healthy pregnancy. Q: What bit of advice or motivation would you give other soon-to-be mothers looking to stay fit and active during their pregnancy? A: My biggest piece of advice is that it is more than ok, in fact it is good for the baby to be active, to continue to workout, or start working out if you aren’t in a regular routine. It is ok to take an easy day if you aren’t feeling it, it’s ok to just get through the workout, and it’s ok to crush it if you are feeling great one day. Be willing to roll with whatever the day throws at you and that it’s going to be different all of the time. Q: With so many shared interests and experiences — from hockey, the partnership with Comcast, and the strive for gender equality with the Be Bold For Change campaign (just to name a few) — what has been the best part about sharing this experience with your sister? A: The best part of going through our first pregnancy together is that we talk to each other about everything (obviously). It is reassuring to have someone going through the exact same thing and we just get to communicate through the excitement, nervousness, and unknown together. Q: What is your favorite part about being pregnant? A: The best part of being pregnant is feeling the kicks. There is nothing like it. 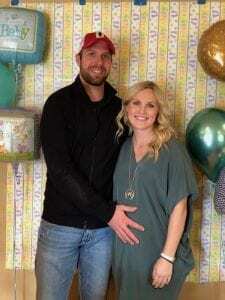 Q: What is your least favorite part about being pregnant? A: The fatigue. It is a tiredness that I have never experienced before and sometimes I’m so tired for no reason. I’ve also started to get restless legs at night which makes it really hard to get a good night sleep. So, I guess my least favorite part is how my sleeplessness and daily fatigue has increased, which I’ve been told is preparing me for when the baby comes! Q: Any food cravings or aversions? A: In the first trimester I loved pickles. In 3 different occasions I ate an entire jar. But, other than that, I have not had any big cravings and I haven’t experienced any food aversions. Q: What made you decide to wait to find out/reveal the baby’s gender? A: My husband and I decided we weren’t going to find out our baby’s gender, because it is one of the only things in life that can truly be a surprise and it won’t matter what the outcome is. The most important part is the baby is healthy and everything after that will be a bonus! Q: Any advice to other mothers about juggling pregnancy, work, and training all at once? A: For me, my biggest learning curve was just being flexible with my schedule. I knew I was going to have a lot of travel days and long workdays, but I still wanted to get my workouts in. My sister and I would adjust our weekly schedule and move around our workout days so that when we had our long days we weren’t trying to squeeze in a lift. It’s important to listen to your body and be flexible juggling your obligations. Some days are tough and some are great, but it’s all worth it! Q: If you could offer one bit of pregnancy advice to soon-to-be mothers what would it be? A: Have a plan and be ready for that plan to change 50 times once the baby comes. I’m a type A personality. I love routine. I love a schedule; and I love knowing what each day is going to look like. I have a general plan for when our baby comes, but I know that my plans are going to change a million times and I’m excited to have that in my life. Q: It has been mentioned before that you and Monique are looking to get back into hockey after pregnancy and take on a 4th Olympics, is there any doubt that baby will have ice time with hockey in their future? A: I would love if our baby played hockey. But I think what I want most is for our child to grow up with a passion in life that excites him/her every day. If it happens to be hockey, I’ll just be able to help them a little more than if it were something else.